What difficulties were involved in making Tennis online? In a typical online game, the information of the button presses are sent to your opponent, and the inputs are synchronised between the players. But for this game you have to send complex information from the gyro sensor6 and accelerometer7 of the Wii Remote Plus controllers, in addition to information from the buttons, which was a brand new challenge.6. Gyro sensor: A measurement device. Its uses include calculating angle and rotation speed, and controlling position.7. Accelerometer: An electrical circuit element that can detect changes in speed. The accelerometer in the Wii Remote controller can detect the rate of acceleration in three dimensions. And in Tennis, there may be four people on the court at once. Yes. 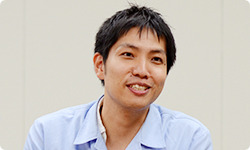 At first, we were uneasy about whether we could really do it, but we tossed around all kinds of ideas with Namco Bandai Studio. 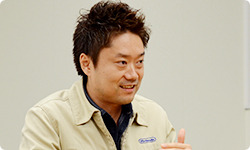 We then decided to test some of the ideas, and the one we eventually adopted was an idea suggested by a communications programmer at Namco Bandai Studio. Thanks to that, we were able to pull it off. It’s now a lot of fun to play, and feels completely natural. 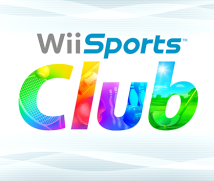 The title this time isn’t Wii Sports U, but Wii Sports Club. What is the background behind that? That e-mail from you that we just talked about played a big part of it. You requested that we must definitely put Miiverse8 to good use, so we thought about how that should work. But if we were to simply implement Miiverse to a sporting game, the winners would probably write cheerful comments like “Yay! I won!” But I bet the losers would hardly write anything at all, like “Oh I’m so frustrated I lost.”8. Miiverse: A network service, integrated with the Wii U console at the system level, that allows people all over the world to connect through their Mii characters and more fully enjoy video games. People can interact by sharing their thoughts by posting comments and hand-written illustrations in the communities of their favourite games. It would overflow with comments from people who won. We were concerned that Miiverse would become a cruel place. We also thought many people who play Wii Sports would have never played competitive games online. If Miiverse overflowed with the boasts of strong players, people playing online for the first time would lose heart. And it would be difficult to say to someone that they should play Wii Sports Club with their friends if they don’t have anyone on hand who they could play with online. So we came up with a way to group people by their regions like states, counties, and prefectures. Everyone has a hometown or someplace where they live, so we thought about setting it up in a way as if at first you join the sports club in the area where you live. That’s how it became Wii Sports Club instead of Wii Sports U. Right. And if we made sports clubs for the various regions, each of the regions could compete. So for example in Japan it would be prefectures, and in America, people would be joining clubs of different states. In America, university and pro sports are big, with states and cities competing. Yeah. In Japan, prefectures play each other, like at Koshien9 in baseball.9. Koshien: A Japanese inter-prefecture competition for high school baseball, held in spring and summer every year. People do tend to favour their own town or country’s team. That’s why we decided to make it a match between everyone’s home teams. Could you tell me exactly what happens when you join your home team? All right. Broadly speaking, there are two parts. One is the club ranking. For example, players in Japan can see the Tokyo club’s winning percentage in Tennis and where they place in a national ranking. And for the most part, the ranking changes in real time. So the rankings are different every time you look at it. But in regional competition, there would be places with tons of people and places with less people. If we had made it to be just a competition of which region has the most wins, there would of course be a great divide between the populated and the not-so populated regions. So we went with winning percentages. They sure do! (laughs) But if they win, their ranking may shoot up all at once. Right. In addition to the average score, it will also display the total number of pins knocked down so far, among other statistics. So even if you aren’t that good, you can contribute to raising the score if you keep playing. That’s right. While we were debugging, the total number of pins reached hundreds of thousands. After service begins, it would be interesting if Miiverse lights up with talk about how a certain region has knocked down so many pins. In that way, having regions compete with each other works well for a sports game. I think so. I would be happy if Miiverse fills up with comments passionate with love of people’s homelands.